Rick's Eastside Pub & Grill - Home of Rick's Famous Burgers! Don't let the road construction get in your way. We are totally accessible. Our front entrance is not blocked by the construction. If your coming West from the downtown area just come as normal. If your coming from the East follow the detour (Clay St. to Dann St.). That will bring you out on Milwaukee St. Turn right and you can get right to us. Call 262-473-9879 if you have questions. 7 large, flat-screen HDTV's. We have the Big 10 Network! Daily lunch specials. Call ahead and we'll have your order ready! 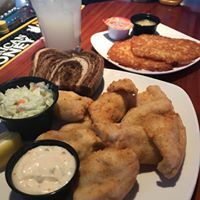 From hand breaded Cod to succulent Blue Gill fillets and everything in between, Rick's Friday Fish Fry (11am-9:30pm) serves up a little something for any appetite! A limited menu is available Friday from 2pm.-9:30pm. Click on Friday Fish Fry to view. Feeling Hoppy? Stop by and check out our selection of bottled IPA's! 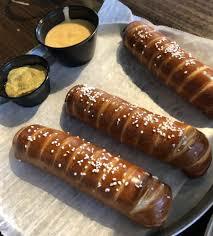 Warm soft Bavarian pretzel sticks served w/ honey mustard and cheddar cheese sauce!